Welcome to my woodworking pages! Woodworking has been a lifelong passion for me, I think it must be a genetic thing. I've been making stuff out of wood since I was able to lift a hammer and push a saw. I have always been able to envision a project and make it happen, regardless of "formal training" or lack of "proper tools". High end tools can certainly speed up the process, but where there is a will there is always a way to get the same professional results. My shop is very modest by todays multi-station, laser guided standards, but I still manage to have a lot fun and create some useful items. Have a look around and click on the links above to see some of the things I have created over the years. This is the "working wall" of my shop area. Toatally cluttered, but everything is in close reach. The back wall is lined with cabinets and heavy duty adjustable shelving for storage of lumber & sheet goods as well as bench saw, miter saw and router table. Sanding storage drawer, sandpaper sheets/disks/pads, 0000 steelwool, polishing cloths. Cheap Yorkcraft lathe ordered off the internet for $250. Looks identical to the low end Jet to me and does everything I need it to (for now). I won't kid you though, its really not that powerful, so you have to keep a sharp edge and pace yourself or you'll stall the motor. 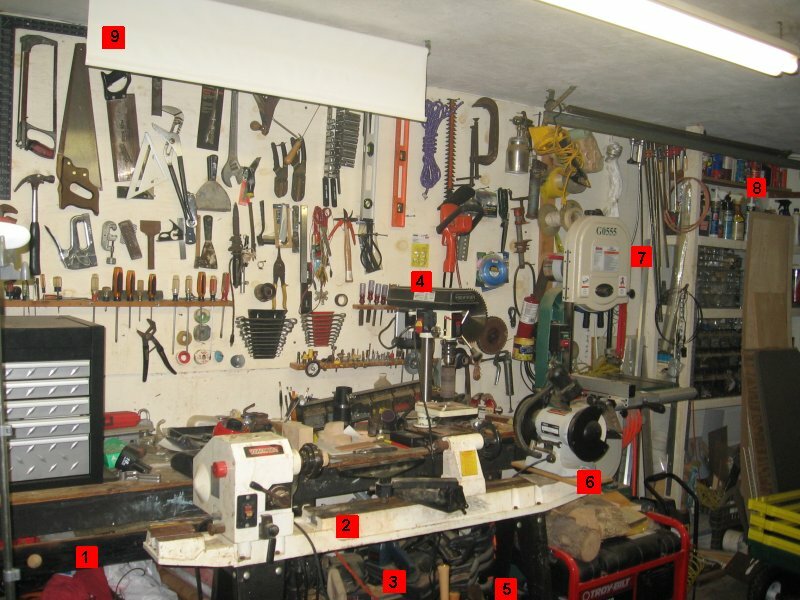 Storage under main workbench for various hand tools; drills, circular & jig saws, routers, biscuit cutter, belt & orbital sanders, etc. Shop Fox bench-top drill press with oscillating chuck. Another cheap online purchase that works suprisingly well for both drilling and spindle sanding. Again, not a powerhouse, but it gets the job done. I added a 3/4 plywood shelf to stiffen the lathe stand and provide storage for tools, centers, chucks, faceplates, etc. Delta variable-speed grinder (white stone) mounted on waste end of lathe bed. Just a step away to sharpen the knives / gouges and the flexible light comes in handy for illuminating hollow forms while turning on the lathe. My pride and joy, the Grizzly 14" bandsaw with a riser block that gives me 12" resaw capacity. This saw is beautiful and has easily become one of the most useful tools I own. More storage for clamps, fasteners and finishes. Pull down blinds in front and back of lathe keep wood chips falling to the floor for easy cleanup.